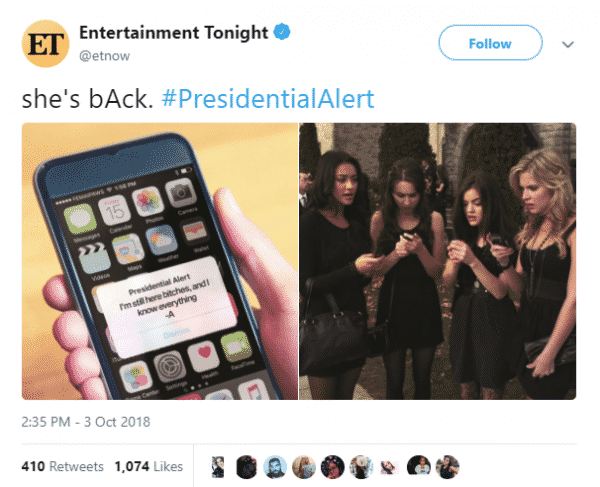 Cell phones across the United States received a “Presidential Alert” on Wednesday, prompting joy, confusion, frustration, and hilarity across the internet. The text message served as a test of the Presidential Alert, which can only be authorized by the President, and communicates with users across the nation using the Emergency Alert System (EAS) only in cases of national emergencies. Congress authorized the public safety alert system in 2008. It became operational under the Obama Administration in 2012 and has been used nationwide, but this is the first time it has been used under presidential authorization. It cannot be avoided through opt-out settings. The result across the internet was entertaining. See some of the reactions below. Some users felt gifs could explain their reaction better than words. Speculation swirled on how the alert might be used for an update on the controversial Supreme Court nominee hearings. …. or some of President Trump’s popular slogans and quotes. The alert sounds on cell phones everywhere could’ve landed some kids in trouble, as one user pointed out. This user remarked on the partisan differences in reactions to the message. Could the message be used in a doomsday scenario? Some users pondered the potential for personal messages from President Trump. This user simply expressed gratitude for testing the emergency alert message. Another gif that expresses this user’s reaction. The alert test is similar to that of Amber Alerts or emergency weather notifications that users have been receiving on their cell phones for years. Today’s notification was different, however. Wednesday’s messages tested the Wireless Emergency Alerts (WEA) and Emergency Alert System (EAS). The WEA refers to emergency messages exclusively sent to mobile devices, while the EAS refers to the system that sends emergency messages through “broadcast, cable, satellite, and wireline communications pathways” to notify the general public.